No matter the size or nature of your event, we have over 25 years experience in event transportation with particular expertise in music transport, theatre transport and exhibition transport. 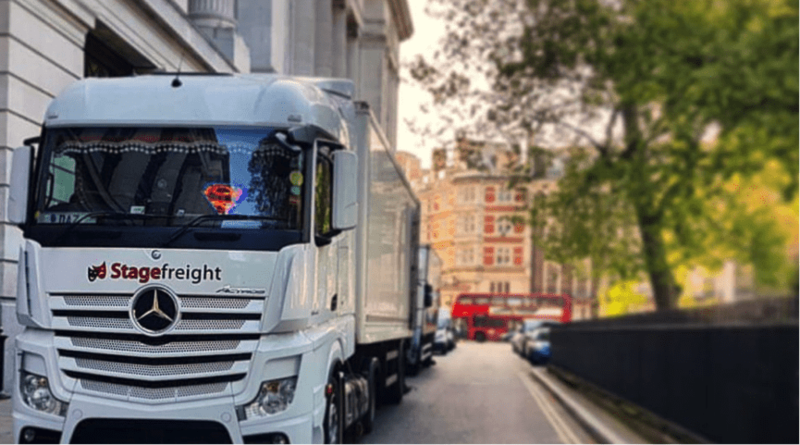 We’re members of the Freight Transport Association and have friendly and experienced staff, who can support you during every step of your event planning. Stagefreight was established in 1986 as a PC Transport company and incorporated as a limited company in 1999. We have strong values, which we encourage throughout the business. Read our policies here. We’re just outside Leeds city centre with a large range of stage truck and exhibition trailer sizes. We have a specialist understanding of TV, Theatre, Conference and Event Logistics and an enviable list of clients from TV and theatre to blue chip companies and popular SMEs. Our experienced drivers are in Leeds, Birmingham and London, and we cover events across the UK quickly, while regularly traveling to Europe and beyond. All of our trucks have high quality tracking systems, so you’ll never have to worry about missing arrival deadlines. Count on Stagefreight to get your show on the road and all your equipment to its final destination on time, every time! Don’t miss your cue to call us today for a free quote.